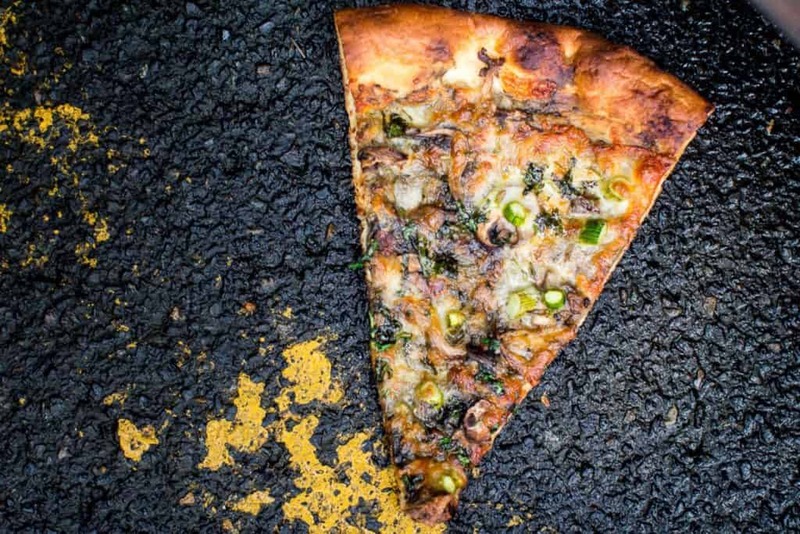 Welcome to the most exhaustive Portland Pizza coverage for the Greater Portland Metropolitan Area area which includes all styles, sizes, crusts, toppings, ovens, trucks and neighborhoods, even that one just over the bridge into the state of Washington. 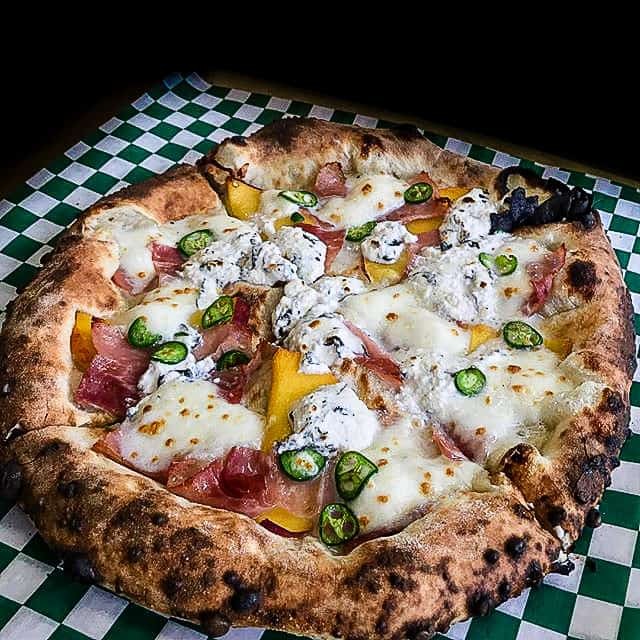 If you are visiting or live in or near Portland, I’ve written this list of Top 35 Pizzas in Portland for you so that you’ll never lack for great pizza. Let’s begin. Sicilian Only! Ranch Pizza launched last year with an interesting concept — you sit at a bar, and they deliver pizza to you. I went twice last year and had a delicious Sicilian pepperoni pie. For a while they were delivering to the corner between 11th and 12th on Division Street in the Southeast but Ranch is now in the process of opening a brick and Mortar on Dekum Street in June, and until then they will re-open any moment at Poison’s Rainbow on 28th Street. Hammy’s is a tiny pizza joint on Clinton Street in crazy Hosford-Abernathy where you go for a nice fat slice with tons of cheese and toppings. “Portland’s Original Nocturnal Pizzeria”, Hammy’s delivers until 4 a.m. They are designed for take-out or eat on the curb — there is no seating except a table or two on the sidewalk, but the folks there are really friendly and I took my teenager there when visiting from college, we brought one home and all went to bed full and happy. Bonus points for green chile topping! 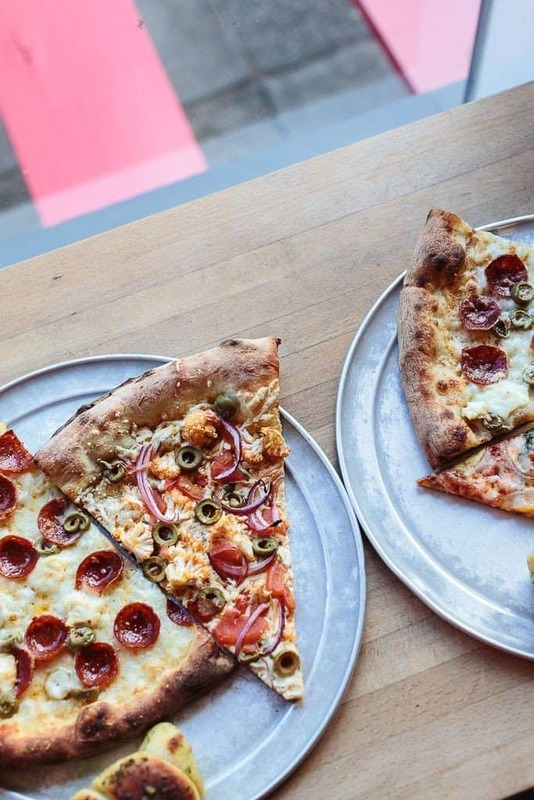 Via Chicago is a fun little neighborhood pizzeria and bottle shop on Alberta Street I discovered during last year’s Portland Mercury’s Pizza Week. They serve Chicago style deep dish tomato heavy and other thick and cheesey pies in a relaxed atmosphere. Order at the counter and get your slice or pie soon thereafter. Bonus points for Euchre games and good Italian Grinder and Chicago Italian style beef sandwiches. 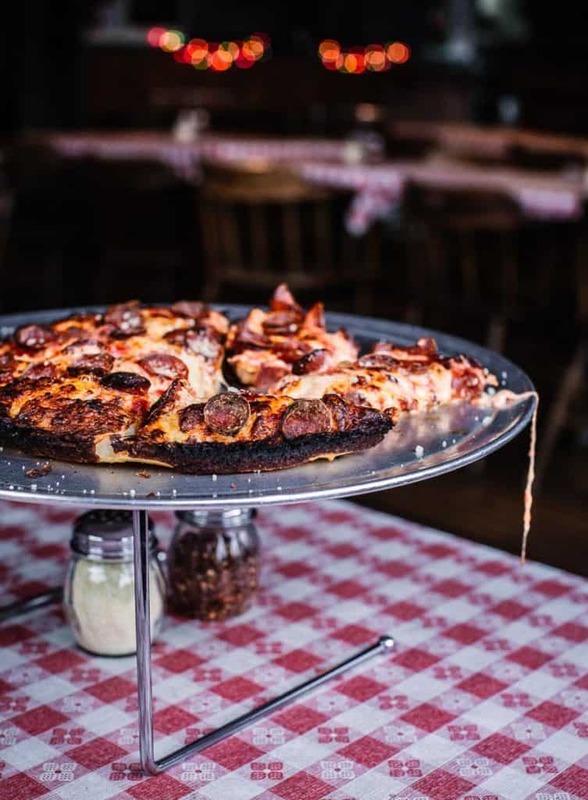 The Crown is Portland famed restauranteur Vitaly Paley’s pizza project connected to Imperial Restaurant inside the Hotel Lucia in the heart of downtown. It’s a great place to stop for lunch if you work in downtown Portland. I’ve been in and out in 40 minutes and had a delicious lunch. You can get slices or a whole pie, or a slice and drink lunch special, and try such uniquities as Fried Chicken with Honey and Ranch, or Hot Sausage with Clams and Oregano. Tastebud is located in Multnomah Village which is a bit of a trek from Portland proper, but not too far. The village actually reminds me a little bit of a little northeastern town with its slightly windy streets and diminutive size. Tastebud’s pizzas are not cheap, but they are amply sized and tricked out with all of Oregon’s locally grown deliciousness. 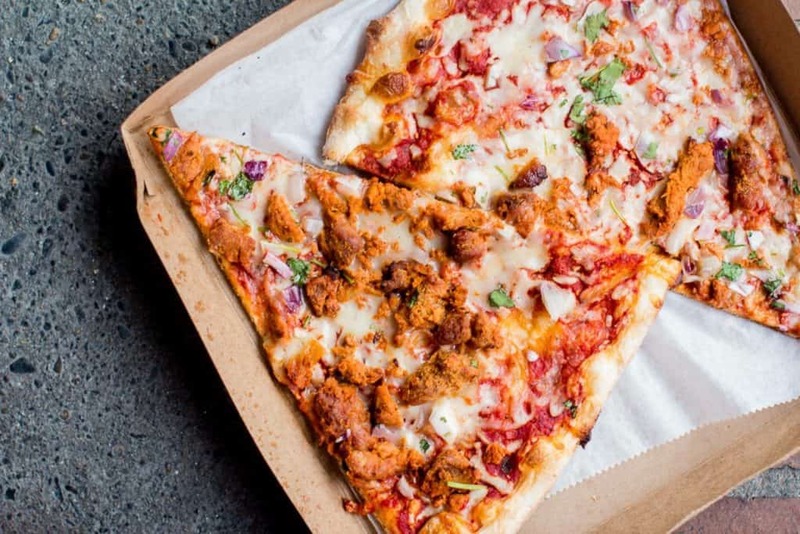 Interestingly, Tastebud started out as a farm, then they built an oven, started making bread and bagels, and finally pizza in the farmers and open-air markets of Portland. Then they became a truck. 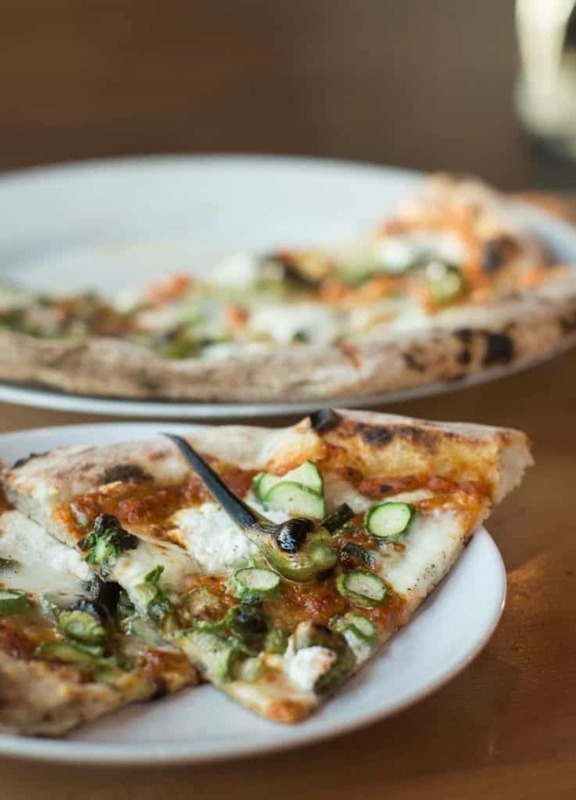 Now not only are they serving some of the best pizza in Portland, but they’ve put Multnomah Village on the map as a Portland dining destination for their wonderful wood-fired pizzas and other hearth foods. Menu favorites include the Autunno Pie, Dill With It, Persian Plum, and Golden Hour. 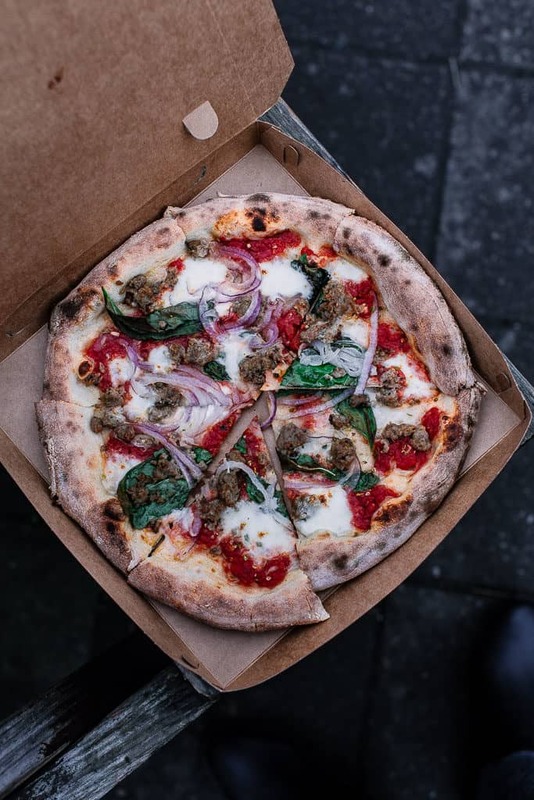 Pyro Pizza is another great Portland food cart, with solid wood fired classic pies such as margherita, marinara, quattro fromaggi, bianca, and fennel sausage and a special pie such as the crazy loaded baked potato concept pie I had a few weeks ago. Bonus points for homemade sodas that are rocking delicious and the best pizza box art from regular customer Tim Butler. 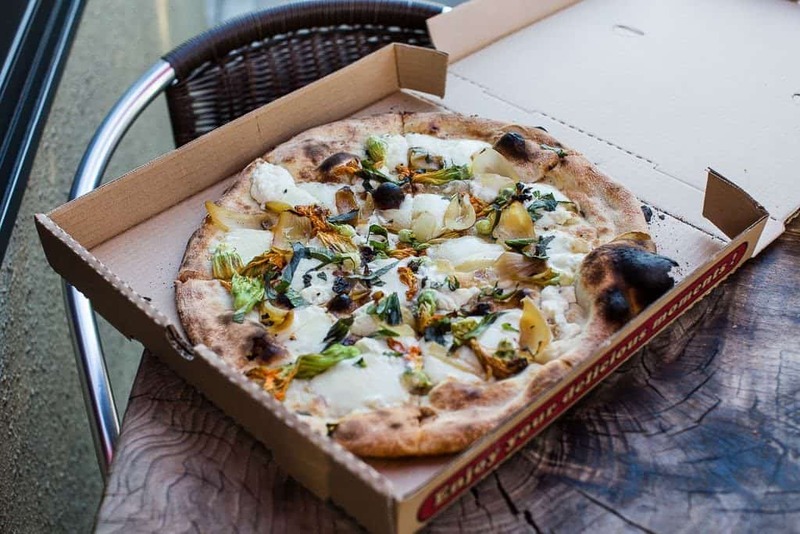 Ash Wood Fired Pizza, whose truck is parked in the lot of the Base Camp Brewery in the Central Eastside Industrial District, is the place that most reminds me of my favorite place to eat pizza in Los Angeles, Lodge Bread. Ash puts out a sourdough starter made with wild yeast from local grapes, and has a wildly creative menu that changes monthly. Their pies are vibrant, juicy and messy and their crust is some of the best I’ve tasted in Portland. 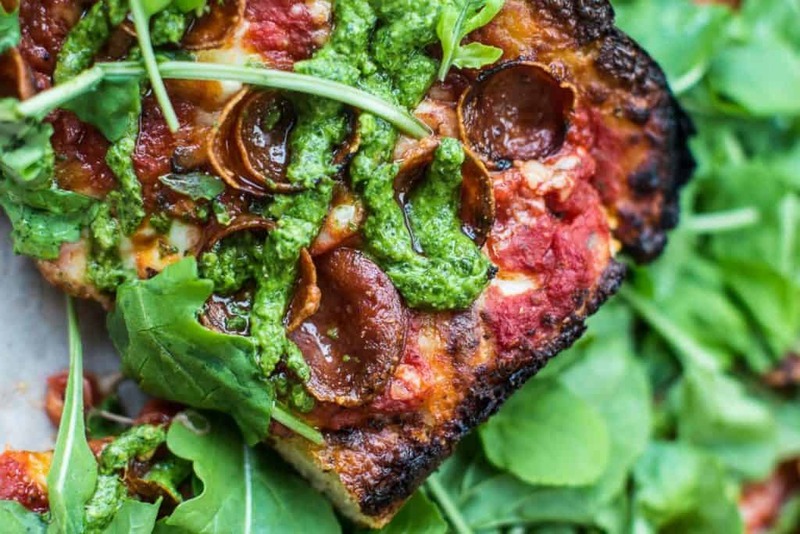 If you want something unique but simultaneously comforting and nearly nostalgic at the same time, come to Ash for some of the best pizza in Portland. See Sizzle Pie for description. 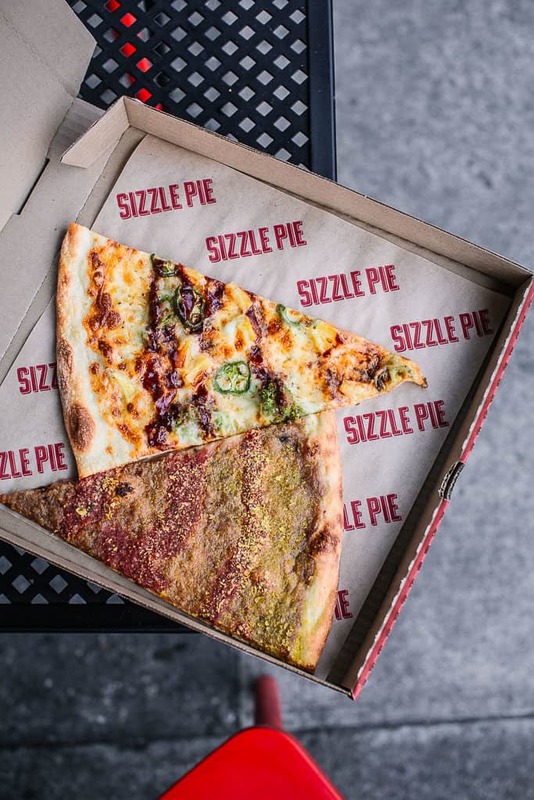 My recommendations for best pizza in Portland if you are in downtown shopping or sightseeing and want a quick hot thin, amply sized slice with plenty of Portland character (wild names, wild toppings) are Sizzle Pie and Hot Lips Pizza. Both have other locations but both also have outposts that are very convenient to the Pearl shopping district, Powell Books, and many of the Portland hotels. Life of Pie originally debuted on Female Foodie in a list we made years ago on our 15 favorite places to eat in Portland. We still love Life of Pie for their amazing pies along the North Williams Avenue strip in the Boise district. The pizza is wood-fired, with a crispy crust and a perfectly soft interior. 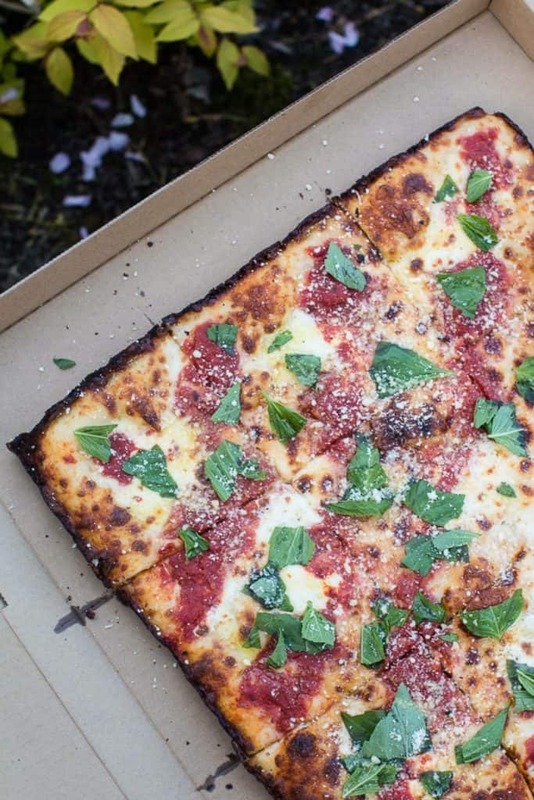 We love the thick and melty mozzarella on every single pie, as well as outdoor picnic benches. Firehouse is located in the very Northeast neighborhood of Dekum in Portland and sadly, for all the times over the past year I drove through Dekum when I worked in downtown Portland and lived in East Vancouver, I never hit it until very recently. I am told by a trusted source that this is a true Neapolitan pie and to that I say: I like a true Neapolitan pie. It had plenty of sauce so that it was a little droopy and juicy, and therefore not dry or a danger to my teeth. I will definitely be back, and you should go too. Oven and Shaker is a happening pizzeria and bar in the Pearl District of downtown Portland where Nostrana’s Cathy Whims is part owner. They have a nice selection of eight specialty pies and four classics, and you can build your own pizza as well. All pizzas are thin and not doughey at all, as you can see from the classic Bianca pie, which features garlic, raschera, sottocenere al tartufo, bufala mozzarella, and fried sage. 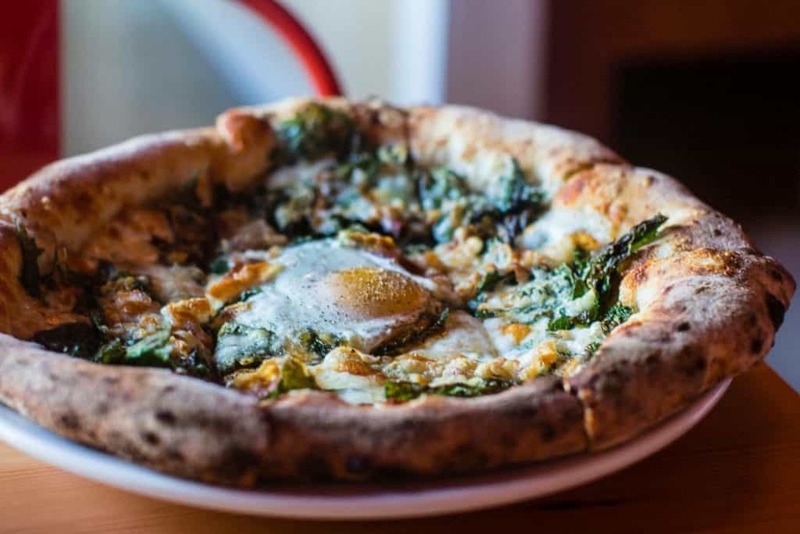 Pizzeria Otto is a family friendly corner pizza joint in the Roseway neighborhood of Portland that has stellar wood-fired Neapolitan pizzas. I had the great fortune of visiting Otto, coincidentally, on a day last year after I had attempted and failed a seasonal garlic spear pizza in my own oven, and when I arrived don’t you know their special pie was a garlic spear pie that blew my mind. I felt happy and sad at the same time. Otto is the only pizza place I am aware of that offers an Amatriciana pie with true guanciale, and oh my heavens is it ever salty and good. Also, Otto earns loads of bonus points for their Happy Hour being all day from 11 – 5 every day, and also every night after 8 p.m. when the Margherita will only set you back $6. Hogan’s Goat is a very unassuming and underappreciated, off-the-beaten-street little joint on Sacramento Street just off Sandy Blvd. in Portland’s eclectic Hollywood district. 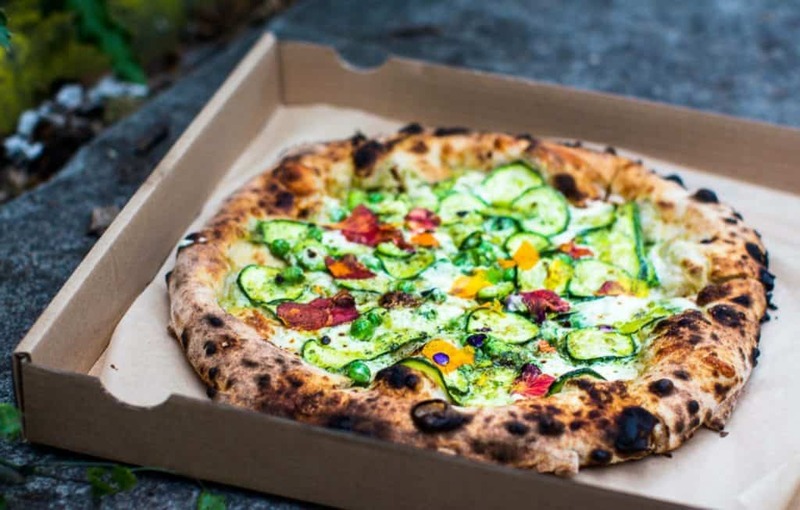 They are at once a pizzeria, bottle shop, and commissary kitchen slinging truly first rate American style pizza, using seasonal local ingredients and hand stretched dough. What you see below is the slice I had for last year’s Portland Pizza Week: Huitlacoche and garlic base, asparagus, mushrooms, provolone, mozzarella, and cilantro. Funky and delicious and some of the best pizza in Portland! 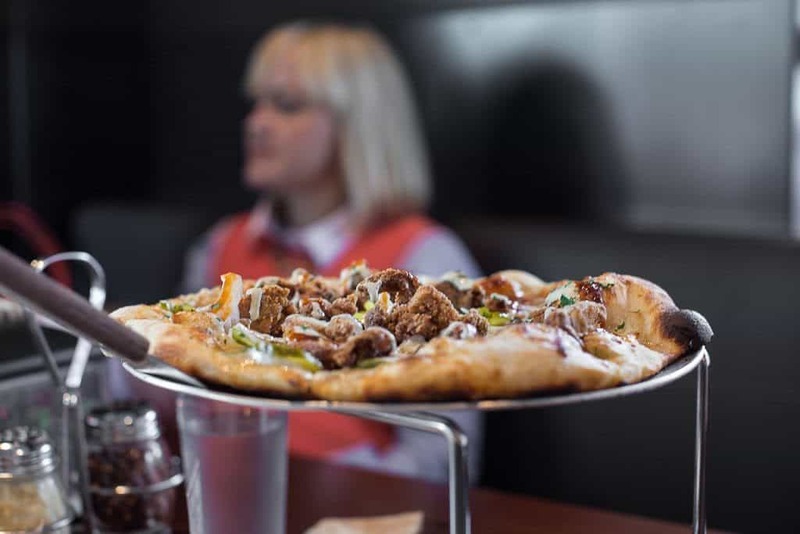 East Glisan serves up great pizza in a modern bar/lounge atmosphere in the Montavilla neighborhood of Portland. 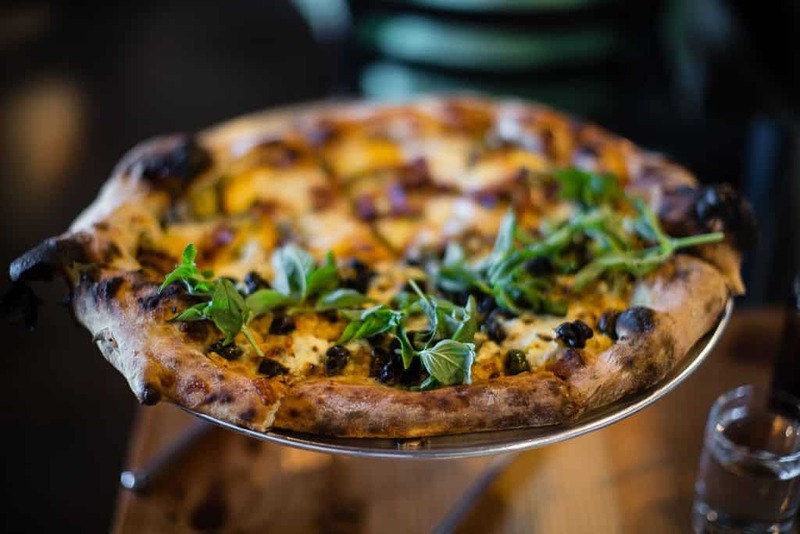 I love their pie topped with sausage, ricotta and green olives, and last spring also sampled a memorable special slice graced with a caramelized onion and cashew base, mozzarella, fontina, asparagus, fried sunchoke, prosciutto, and gremolata. Don’t forget to try their square pan pies on Tuesdays and Saturdays. 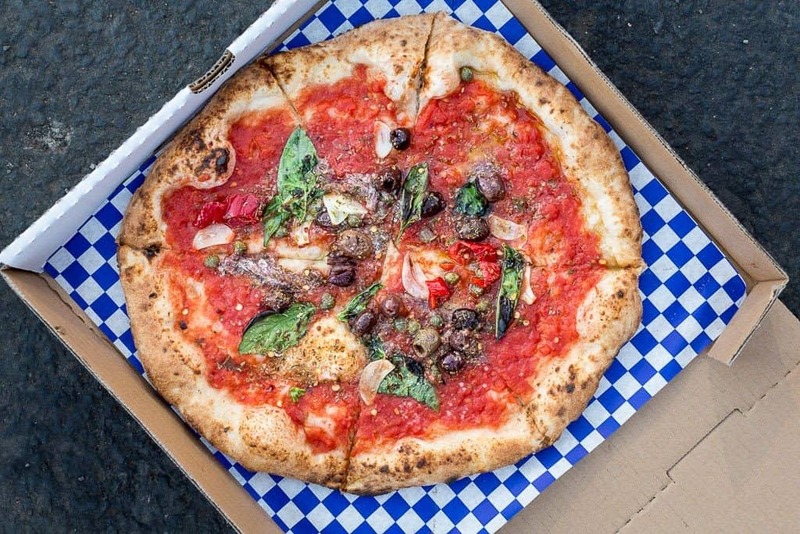 I discovered Atlas Pizza during last year’s Portland Mercury’s Pizza Week wherein I ate 9 slices in 5 days. 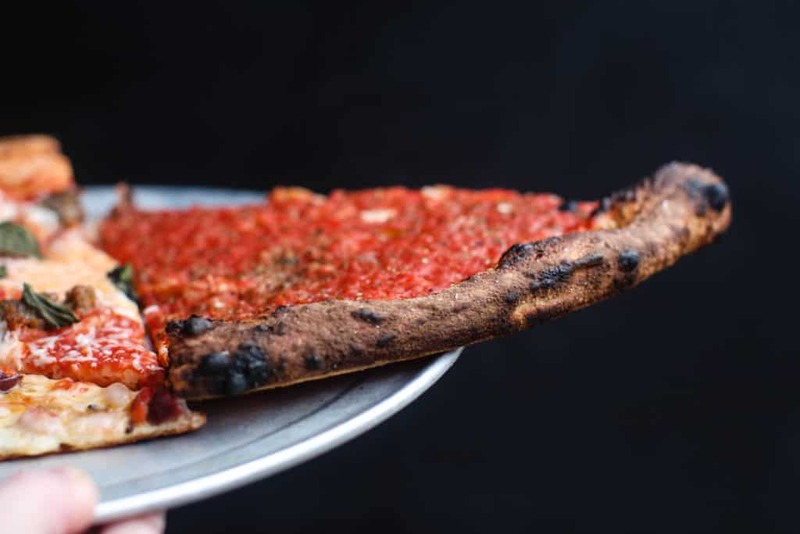 Atlas pies are quite thin and crispy, and a perfect reason to stop if you’re tooling around SE Division Street shopping and hungry for a quick bite. 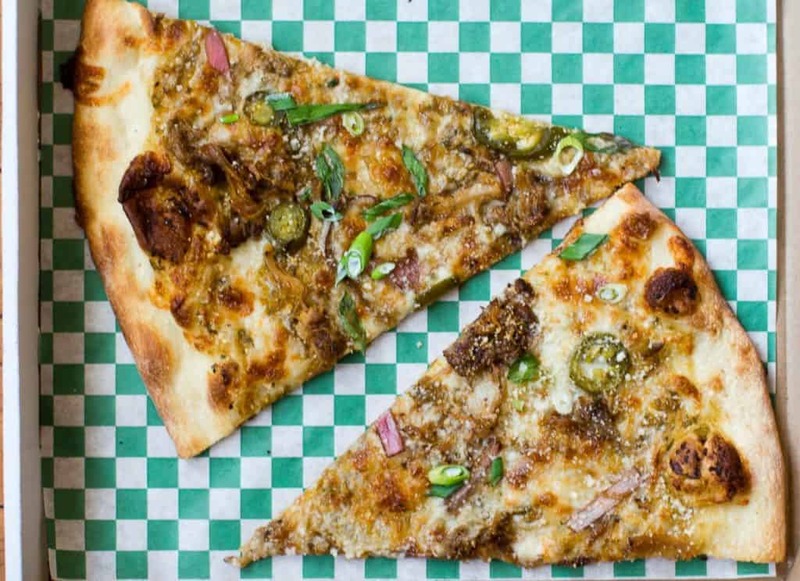 Pictured are my “Ziggy Piggy” slices featuring Smoked Carlton Farms pulled pork, tomatillo and chile verde sauce, balsamic onions, pickled jalapeño, and fresh scallion and cotija cheese. Great slice and drink/salad combo deals as well. 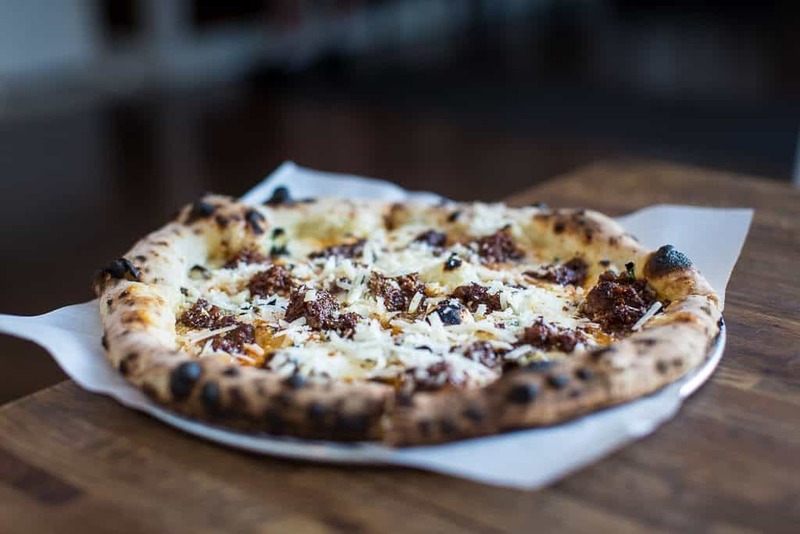 Please Louise opened just last year in the rapidly growing and seemingly constantly under construction historic Slabtown neighborhood of Portland, serving up tasty creative pizza and small plates. I would characterize PL’s pies as thin crusted, deck oven fired, and not bread-ey. 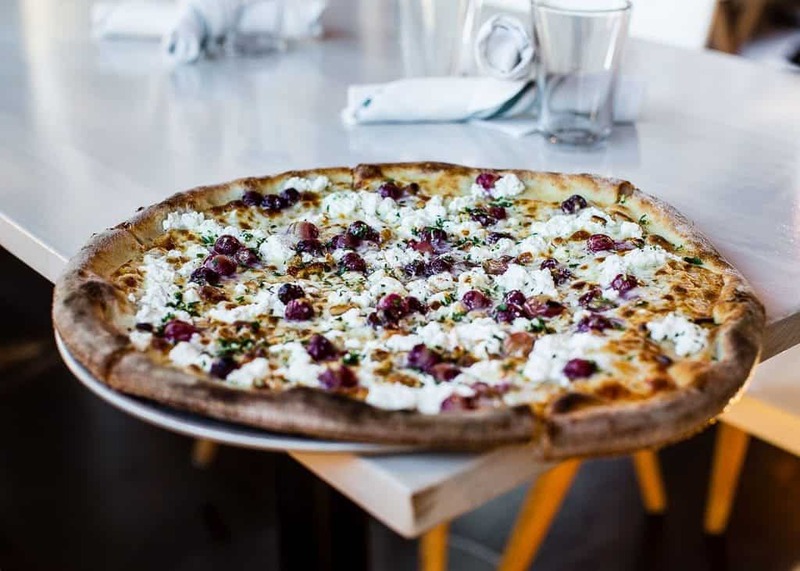 On a recent visit I had a very nice pie with grapes and goat cheese, which was fresh and light, sweet and salty, and a welcome alternative to all the classic red pies I’d been sampling- one of our favorites spots for the best pizza in Portland. Cibo is a thriving SE Division Street neighborhood restaurant serving regional Italian cuisine in a relaxed and stylish environment. Their sixty-foot bar wraps around an open kitchen including their wood-fire pizza oven. 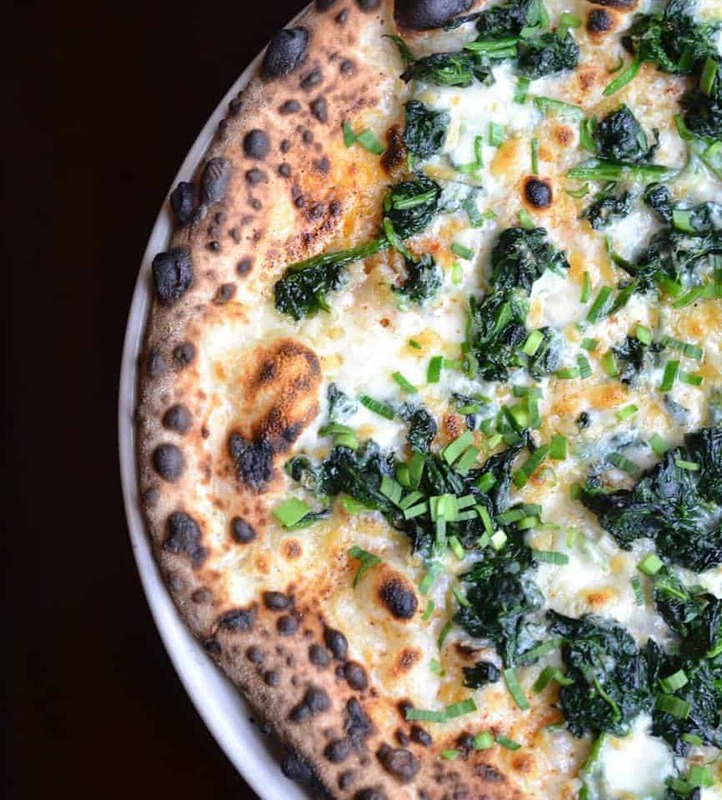 Chef Marco Frattaroli is a longtime pizza master in Portland and his pies here are testament to that earned expertise. 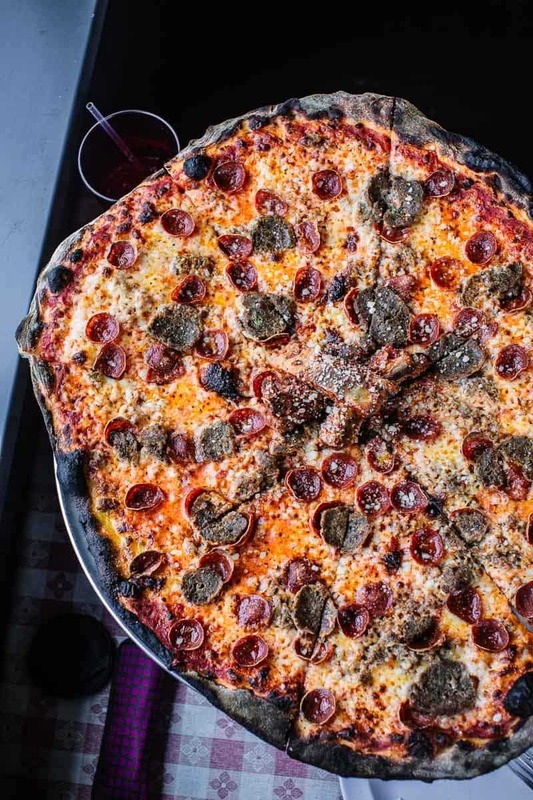 Bonus points for stromboli, cecina (garbanzo flour crust alternative) and for being the only restaurant that appears on this list as well as our Top 50 Burgers List. 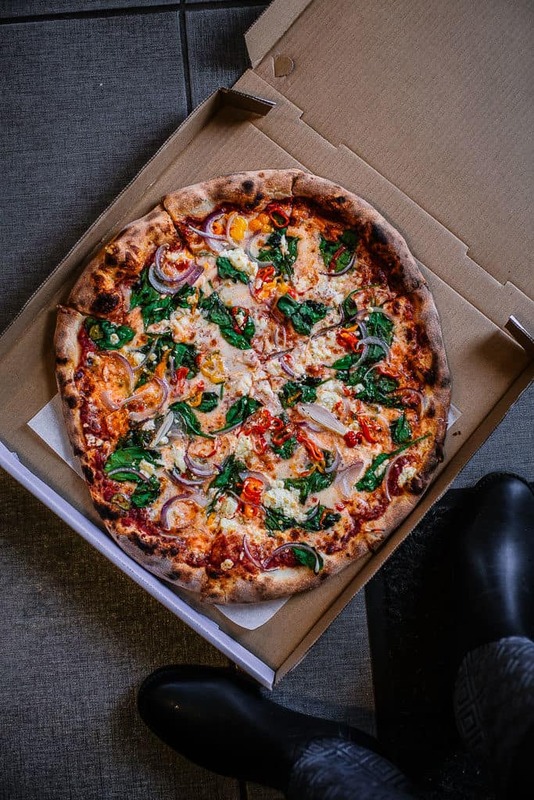 Virtuous Pie is where you want to go if you’re looking for the best pizza in Portland that’s vegan — they are all about creating food that looks and tastes vibrant, is good for your body and supports a healthy planet. 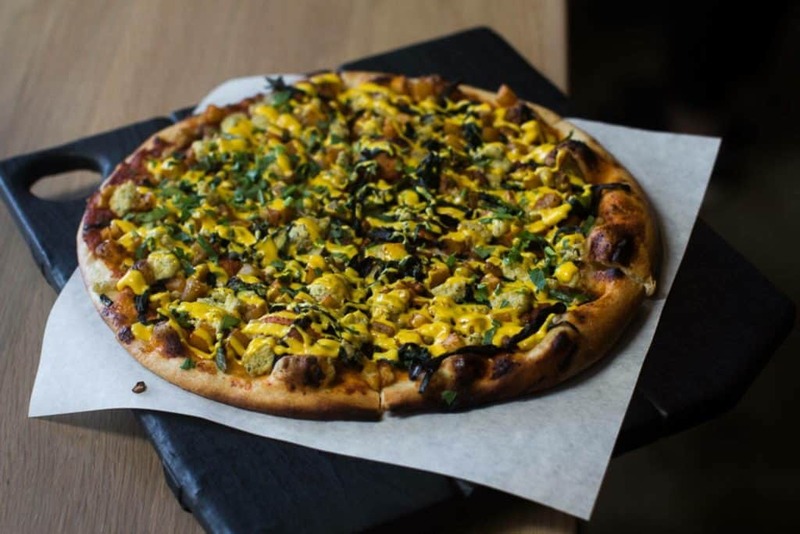 My must-try recommendation is the Ultraviolet with walnut and arugula pesto, cashew mozzarella, oven dried tomato, flowering kale, caramelized onion and pine nuts. Bonus points for donuts and outstanding vegan ice cream. 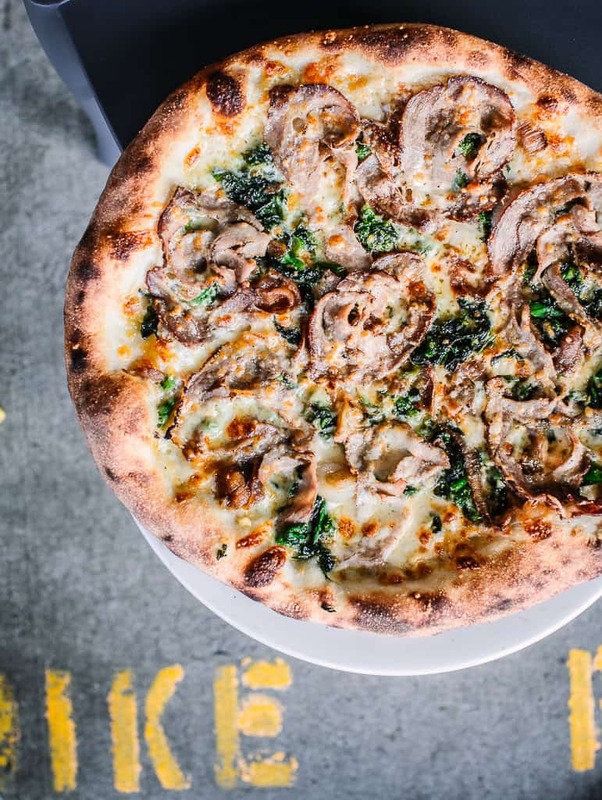 Dove Vivi Pizza serves some of the best pizza in Portland and stands out for its unusual, beguiling cornmeal crust. I love Vivi pizzas not only because the crust has a wonderful buttery flavor and a substantial heft, but also because that advanced weight can hold a sizeable mantle of melted cheese. Yes, this is the best pizza you want when you’re really hungry and want something pretty departed from a “normal” pizza. 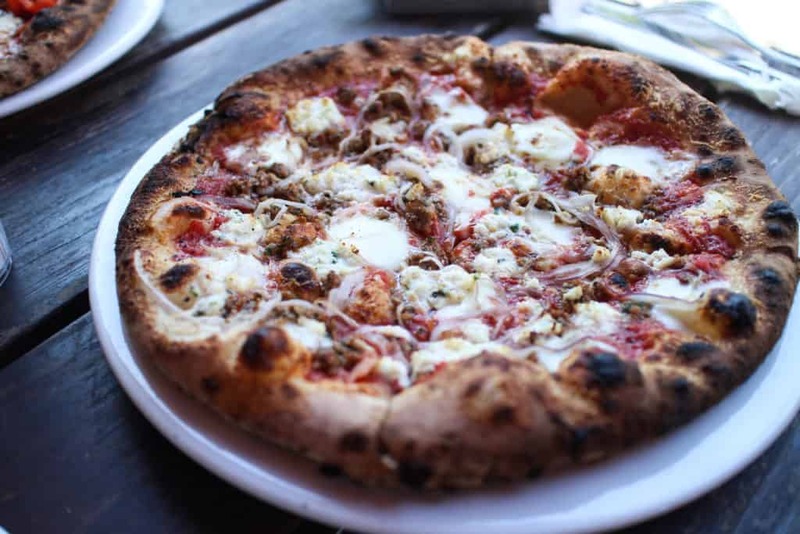 Baby Doll is a great option for some of the best pizza in Portland that will resonate with almost anyone. Baby Doll has slices, garlic knots, whole pies and cookies. 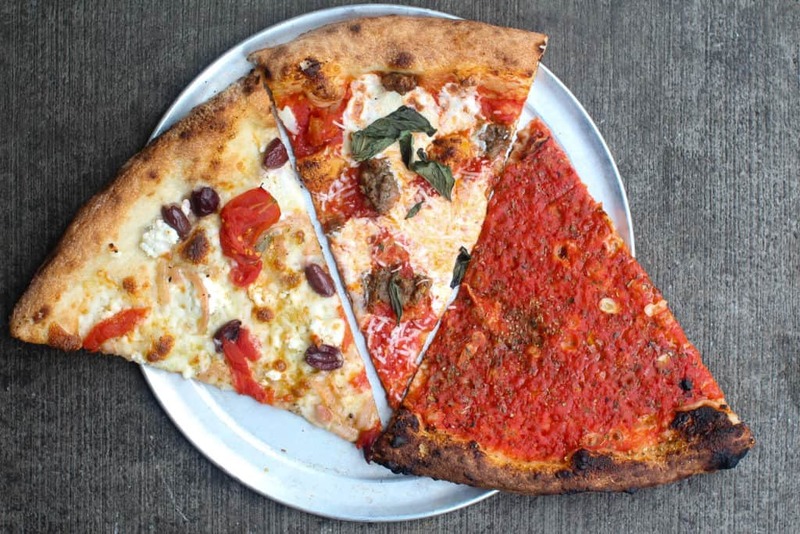 Their New York style pizzas are a formidable 18″ and will feed your family for a week. Bonus points for Sicilian pies and slices, Shirley Temple sodas in the case and gluten free offerings. 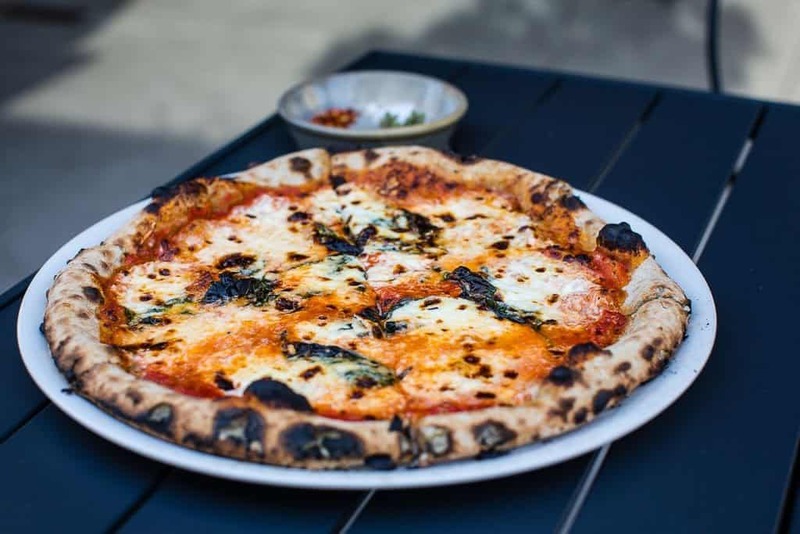 Although I was not a resident during Portland’s beloved PREAM pizza tenure, I am pleased that even though PREAM is shuttered, their former pizza chef Nick Ford is making pies at the very chill bar Hosford-Abernathy neighborhood bar and restaurant Associated. Associate’s pizza has got another great Neapolitan-style crust with toppings classic and offbeat. Bonus points for an all-around great menu with vegan options, including delicious little tacos. 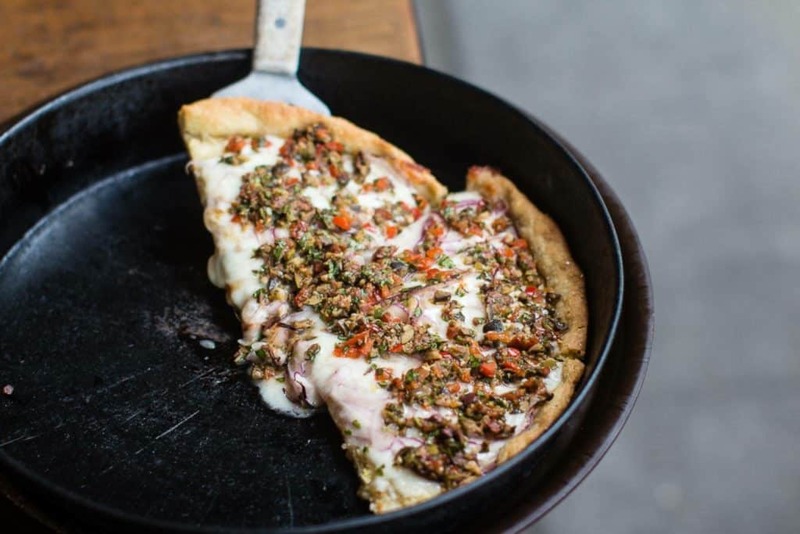 Roman Candle makes a wonderful selection of Roman inspired, almost focaccia-like flatbread crusted slices topped with classic red sauce or white, and including toppings such as pepperoni, mushroom and seasonal vegetables. 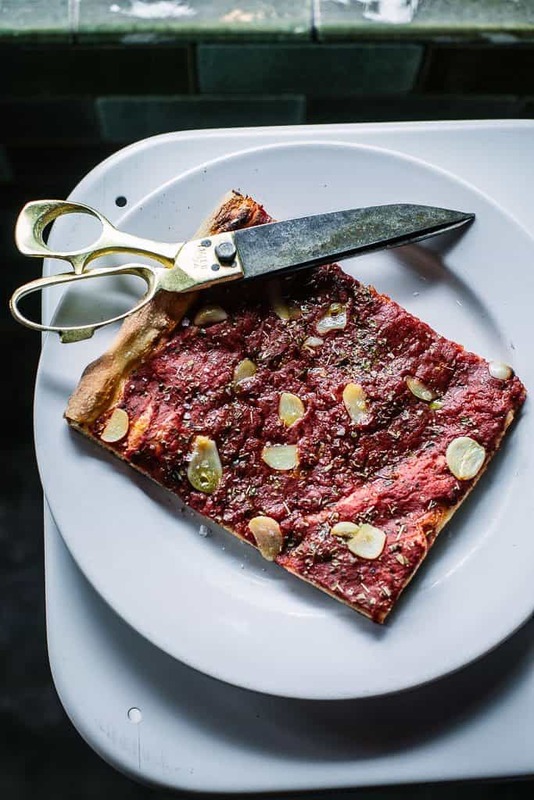 We love their beautiful heavy pizza shears, as well as the gigantic communal table which is a perfect spot to read your paper, work on your laptop or visit with a friend (or a stranger). A pizza experience you won’t find anywhere else and one of our top choices for the best pizza in Portland. 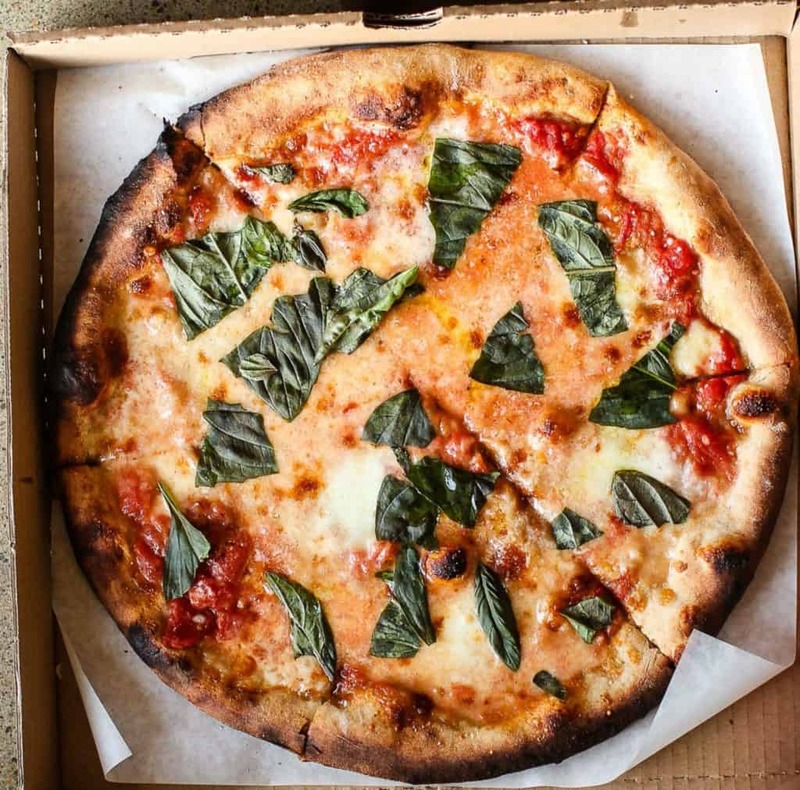 Ken’s Artisan Pizza is legendary and without question some of the best pizza in Portland. If you ask a Portlander where the best pizza in Portland is, Ken’s will undoubtedly come up in the first few breaths. You may recall Ken Forkish mentioned in our Top 50 Burgers in Portland, as he also runs Trifecta, Ken’s Artisan Bakery, and Checkerboard Pizza inside the Pine Street Market. Ken is a true artisan and has written a book on pizza that is likely many a home pizza chef’s bible. His pizza is wonderfully thin crusted and quite crisp, yet not dry. Ken earns bonus points for the refined nature of his pies, spare application of toppings and the best tomato sauce in town. 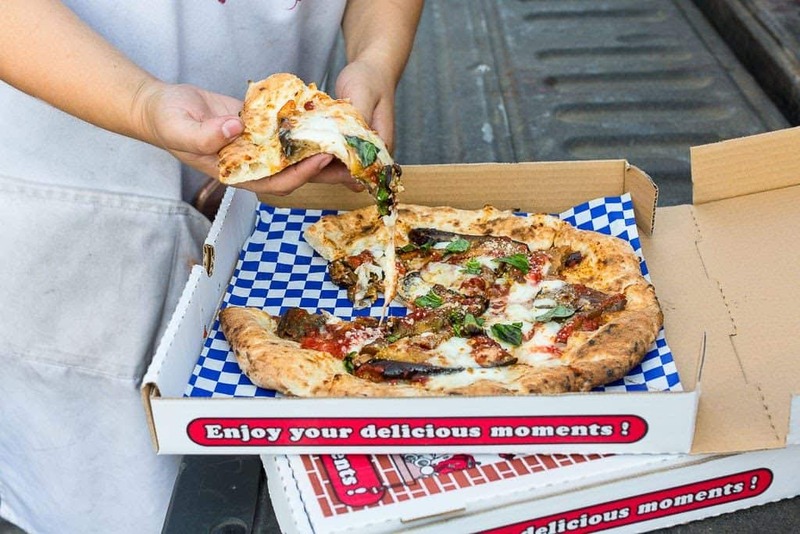 Daisuke Matsumoto runs a blue pizza truck parked in front of Cascadia Brothers Brewery, and serves not only some of the best pizza in Portland but the best authentic Neapolitan pie in town. 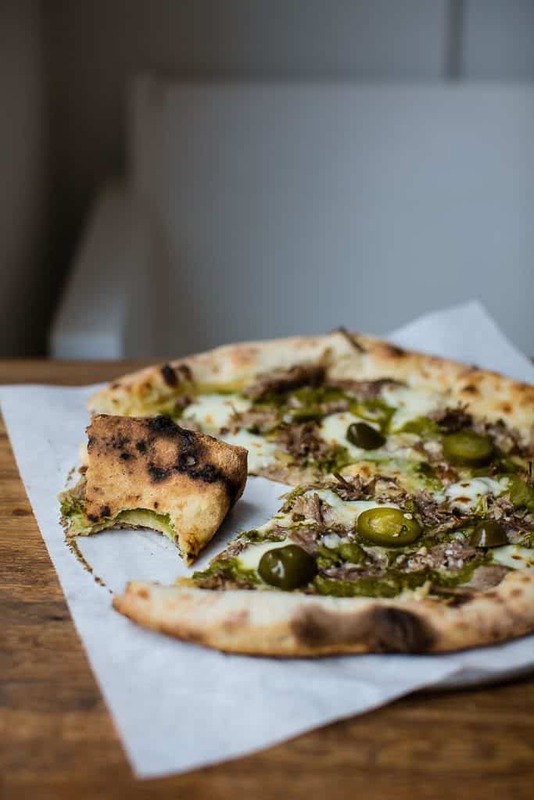 Inside the truck sits a little wood-fired oven where the pies, from classic margherita to specials like the recent smoked duck pie, are fired and ready to eat in minutes. These pizzas are as Neapolitan as you’ll see in this region — not too charred, soft and elastic, tender and fragrant. Definitely one of the best if not the best pizza in Portland. Bonus points to Daisuke for the warmest spirit and winningest smile in all of the Pacific Northwest. 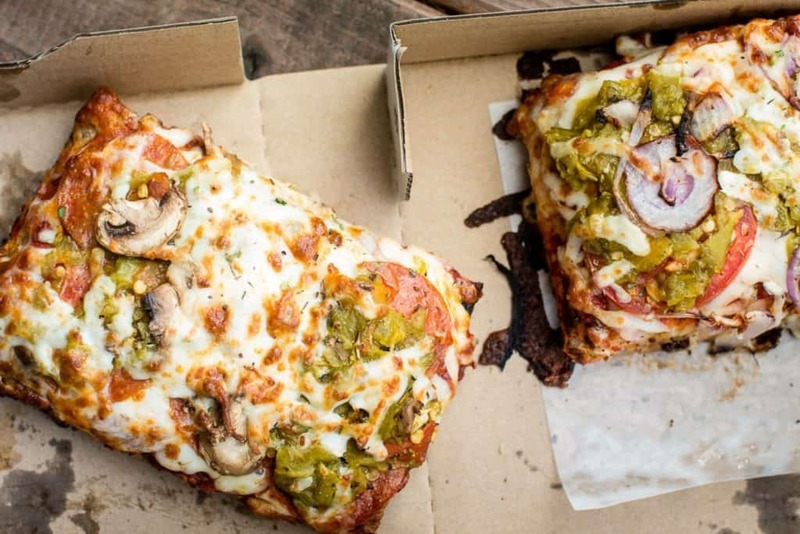 Rally Pizza is another excellent reason to make the trip over the bridge into Vancouver. Husband and wife team Alan Maniscalco and Shan Wickham run this wonderful restaurant that besides offering delicious Neapolitan pies, also serves up wonderful wood-fired vegetable roasted dishes, salads, and frozen custards and concretes. Both pedigreed bakers and chefs, Alan comes most recently from Portland’s legendary Ken’s Artisan Bakery where he helped launch their wildly successful Monday pizza nights and Shan slings the pastries and runs the front of house. My current favorite is the Margherita. Another recent rival for my all-time favorite pizza was a white Sicilian pie from Rally with spiced cured pork loin, rapini, rosemary, onions, smoked mozzarella, pecorino, chile fennel garlic oil. Whoa. Definitely some of the best pizza in Portland. Finish your meal with a frozen custard or concrete. 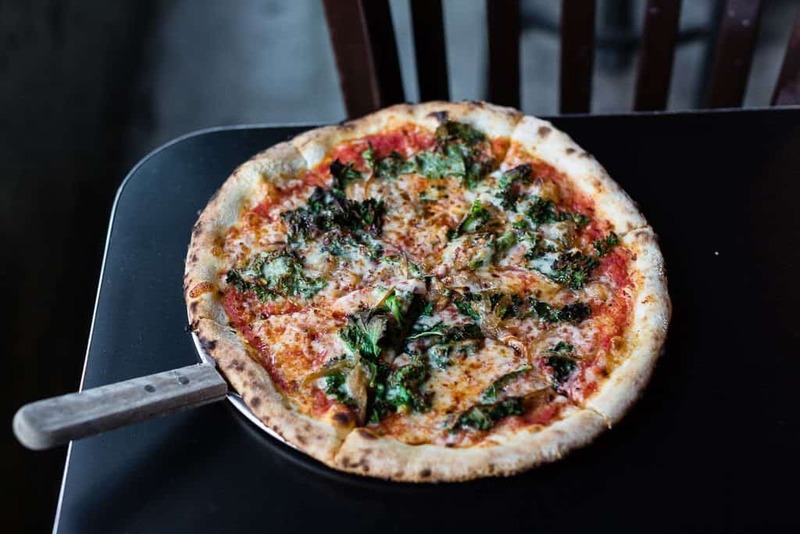 Red Sauce Pizza serves up some of the best pizza in Portland, including calzone, vegan pies, fun pies named after fun people, pan pies, and weekly sourdough bread. 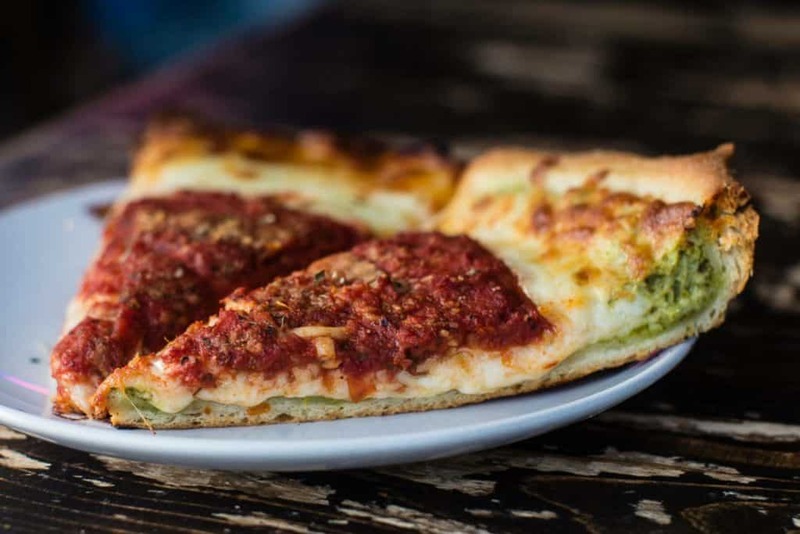 Situated in the colorful yet low-key Cully neighborhood, Red Sauce is run by longtime pizzanista Shar Dues (a former manager at Apizza Scholls) who makes a wonderful slow fermented, chewy crunchy dough with plenty of structure. In a nod to continuity and elder respect, Shar has maintained the upside down AZZIP sign just as it hung for the previous original Bob’s Pizza owner Bob Cassidy at Red Sauce’s homefront. My current favorite here is the Fern which features spinach, house pickled peppers, red onion, and goat cheese and will feed you for a week. Renata is in the center of Portland’s Industrial Eastside District, which is filled with local artisans, hip eateries, and trendy shops. They have a small pizza menu for those of us who consider too much choice to be a form of tyranny (poke bars, make your own salad restaurants) which includes a first rate, traditional margherita, pepperoni and quattro fromaggio pie- all some of the absolute best pizza in Portland. The crust has a nice swollen rim and is thin and soft. You can also come here for some of the best pasta I’ve eaten in Portland, as well as a sublime butterscotch budino pudding. Scottie’s was one of the pizzerias represented in last year’s Bureau of Pizza Investigation I attended wherein we sampled pies from Scottie, Red Sauce and Handsome Pizza (see below) and discussed and took notes on (with our special pizza journals) the nuances of every last thing of a pizza nature including dough fermentation, flour type, oven type, method, technique, tool and topping. As with many pizza chefs I’ve met, Scottie impressed me with his friendly nature and humble desire to bring people happiness through good pizza. Scottie serves up a wonderful giant Nonna pie as well as the basic classic pies. Nothing too outlandish . . . except that after 10 p.m. every first Friday of the month they crank their oven to 923 degrees to turn out 28 inch pies and they are currently applying to the Guinness Book of World Records for their once a year 100 cheese pizza! A tiny but mighty establishment in Southeast Portland on Division Street, Scottie’s earn bonus points in my book for offering a substantial slice for just $2. You may recall my mention of Handsome when I wrote about on its daytime sister, Seastar Bakery. Handsome Pizza has a special place in my heart because it is the first pizza I ate in Portland, and used to be a weekly stop on my drive home from Portland to East Vancouver. I’ve tried every regular rotation pie there, and loved every one. Located at the corner of NE Killingsworth St. and 16th Ave., which is becoming a one stop building for good food in Portland (Hat Yai, Podnah’s, Tea Bar), Handsome Pizza sits inside an updates 40’s era former hardware store. They use a hand-build, wood-fired oven and make their own dough and I believe mill at least some of their own flour. They are true pizza nerds who feature locally made artisan products and support our local farmers and growers. Bonus points for the awesomely whimsical art in house, featuring Chris Walas, who constructed the shop’s mascot monsters, and Lyra Butler-Denman, who made the unique comic book lamps. 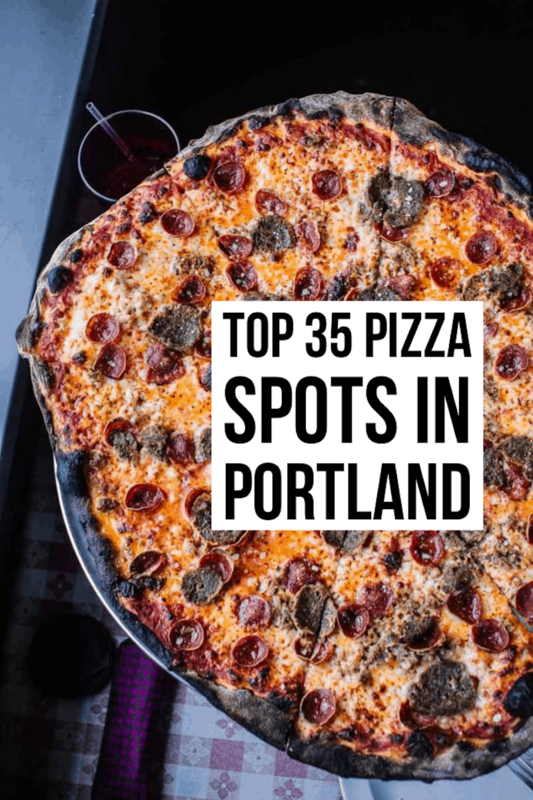 When I first moved here from Los Angeles in 2016 and began to search the best pizza in Portland, my trusted restaurant source directed me to Apizza Scholls as his top insisted Portland pizza experience. Somehow I lucked out with an off-peak hour appearance and missed the lines and crowds, and Scholls deeply impressed me with their neo Neapolitan pies — the crust was perfect, with a crunch on the bottom, but a retaining bread-ey integrity that held together if you folded it. They use an electric oven to achieve a nice, even light scorching so the crust has a bitter burn that balances with the yeasty dough perfectly. There is not a frill in sight at Apizza Scholls, just solid classic pies and a few creatives thrown in for good measure, such as this PB & J with house made canadian bacon, pineapple and jalapeno. Apizza Scholls makes an outstanding Caesar salad as well. Nonavo is just over the bridge and into Vancouver, WA, technically considered part of the greater Portland metropolitan area. It’s my weekly pizza stop for such indulgences because they serve some of the best pizza in Portland. The bolognese pie is one of my favorite pies of all time, made with garlic, ragu, oregano, mozzarella, and that beautifully sharp, almost grainy grana padano. Nonavo is a family affair, run by chef Joey Chmiko and his wife Alder Suttles. The art that decorates the white walls, ceiling and trim are portraits drawn by friends and family members, a sendup of East Coast pizzeria tradition to put famous people on the walls. Nonavo offers a wide menu of always-available pizzas as well as an always inventive nightly special based on seasonal farmer’s market provisions, which is what I usually order. I would characterize the pies as Neapolitan with twists. The dough is scratch made, and the pies fired in a beautifully tiled wood burning oven, and come out charred with an underlying soft pillowy chewiness. While you’re here make sure and try some of the homemade small batch ice creams and some of the best salad and/or veggie appetizer specials in Portland, creatively dressed and accessorized, made often with a base of pureed vegetable or starch on the bottom so you can drag your greens through. Genius. 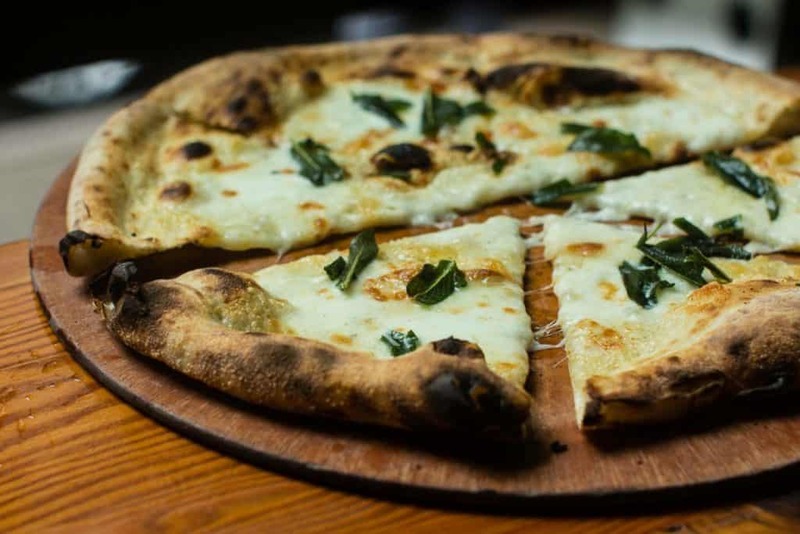 Nostrana is without a doubt one of Portland’s finest restaurants and has been serving some of the best pizza in Portland for many years. You’ll go here for a date night or grown up dinner experience, without the stuffiness or attitude. And for the best pizza in Portland. With the name Nostrana meaning “ours”, ultimately this is a place for the whole family. Helmed by Cathy Whims, a six-time James Beard Award finalist, Nostrana opened as a husband-wife team operation (David West) in 2005 and has been serving noteworthy pizzas, pastas, and seasonally driven Italian fish, fowl, meat and vegetable dishes ever since. 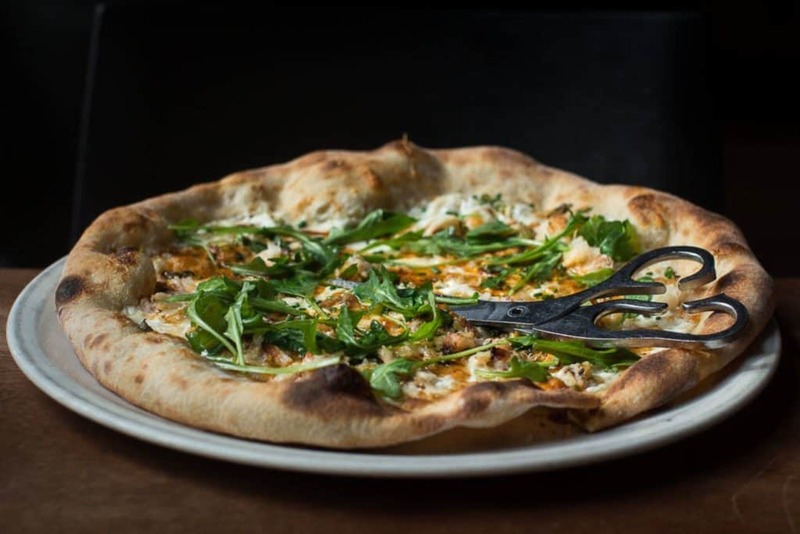 At Nostrana, expect a first rate thin, wood fired pie with all the classic toppings, as well as sophisticated seasonal specials. Pizza Jerk is my pizza fountain of eternal youth — I could eat twice per week or more and I’d never grow tired of it. 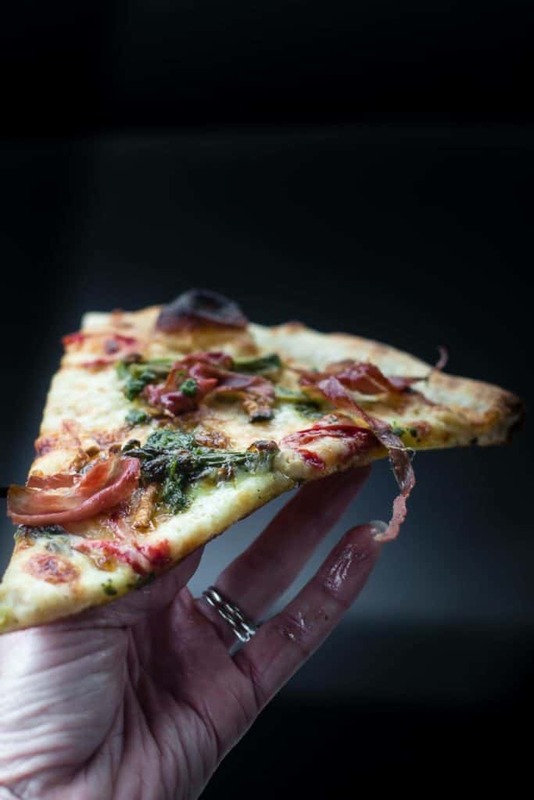 It’s Portland’s wonderful whimsical pizza wizard, serving up gigantic punked out pies such as this one above with meatball, sausage, pepperoni and ribs; cast iron deeper dish “Detroit style” pies, pastas such as dan dan noodles and cacio e pepe, and a classic Connecticut clam pie. I love the open and friendly vibe at Pizza Jerk, where you feel like anything is possible and no one is judged. 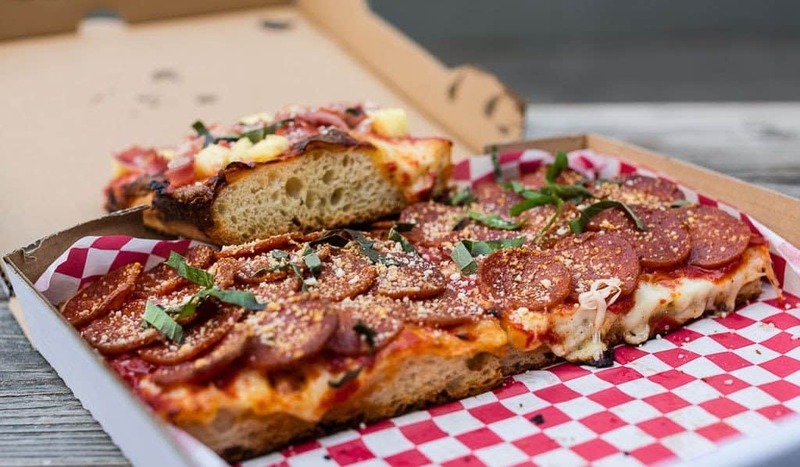 Pizza Jerk, also in the Cully neighborhood, comes to us from the wonderful Bunk Sandwich empire helmed by Tommy Habetz and soon they will be opening a location downtown. We love Pizza Jerk for fun neighborhood people watching, the pizza by the slice availability, and an excellent dining choice for the kiddos. 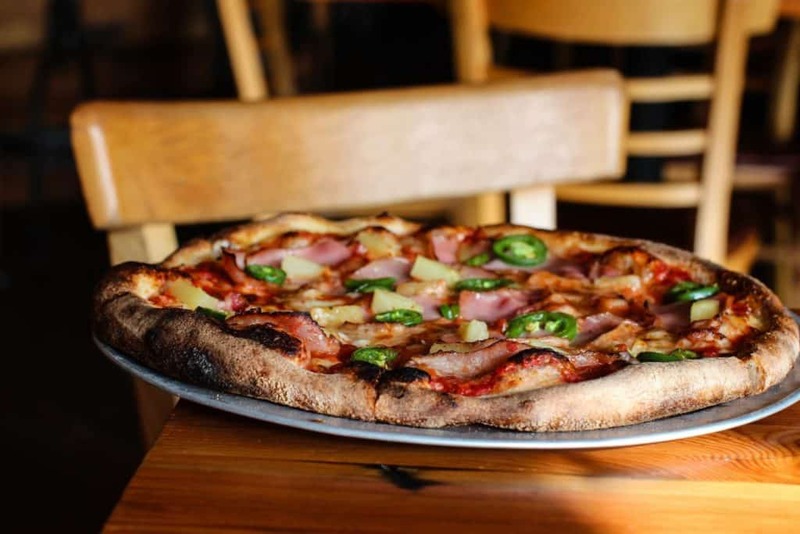 If you’re looking for the Best Pizza in Portland, you can’t avoid a trip to Pizza Jerk. My current favorite pie at Pizza Jerk is the cast iron pepperoni pie. It’s cheesey, deep and chewy, with plenty of juice to the crust and those wonderfully buttery crispy edges. After Lovely’s this is probably my second favorite singular Portland proper pie. Aah, Lovely’s how I love thee. My favorite pie in Portland proper. The Lovely’s Fifty Fifty Pizza, served up by the wonderfully creative and spirited Sarah Minnick, although changing by week and season, consistently has everything I love on and in a pizza: organic and naturally leavened dough, locally grown produce, juicy sauces and condiments, and eggs. Also, the Fifty Fifty pie has more of everything I love in a pizza: more smell, more color, more character, more taste, more chew. Yet it is not heavyhanded or overdone, just in possession of every good pizza element in its perfect fullness. 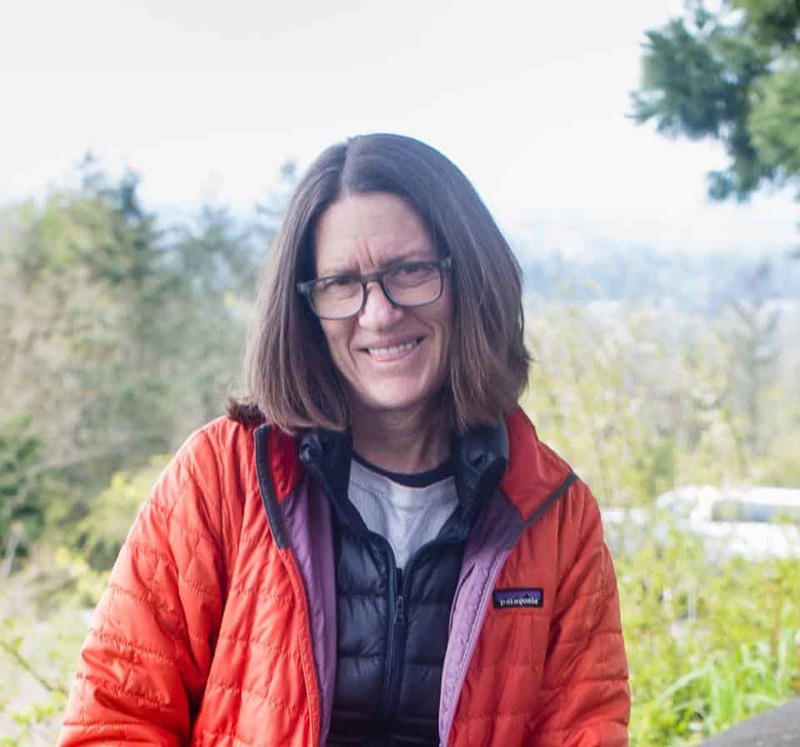 Sarah, who is currently a Semifinalist in the James Beard Awards for Best Chef NW 2018, will catch your eye with her use of whole grain flour in her doughs, and for Lovely’s eye towards aestheticism. The Fifty Fifty pie is wildly vegetable centric, sporting regular players such as my favorite, fenugreek greens. The dough has a delicious earthy deep flavor and I could eat it straight up. It’s not cracker thin, but has a nice toothsome thickness, which I like. If you want to eat my number one pick for the best pizza in Portland, come here. Check out Double Mountain on Woodstock and in Hood River. I love the food articles about Portland. Pretty sweet there are 3 from Vancouver in the Hot 12 list, that’s saying something!! I agree, Vancouver is really growing into a good eating city! Thanks for your kind words, too, I so enjoy writing about food. Why not escape from New York? Oh my, I need to go there. Thanks for the tip and I can’t wait to go!